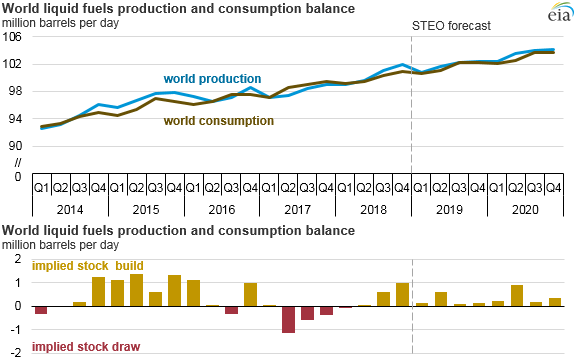 EIA’s January Short-Term Energy Outlook forecasts that world benchmark Brent crude oil will average $61 per barrel (b) in 2019 and $65/b in 2020, an increase from the end of 2018, but overall it will remain lower than the 2018 average of $71/b. 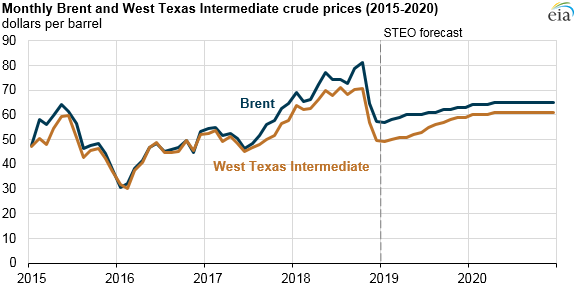 U.S. benchmark West Texas Intermediate (WTI) crude oil prices were $8/b lower than Brent prices in December 2018, and EIA expects this difference to narrow to $4/b in the fourth quarter of 2019 and throughout 2020. EIA expects U.S. regular retail gasoline prices to follow changes to the cost of crude oil, dipping from an average of $2.73/gallon in 2018 to $2.47/gallon in 2019, before rising to $2.62/gallon in 2020. Because each barrel of crude oil holds 42 gallons, a $1-per-barrel change in the price of crude oil generally translates to about a 2.4-cent-per-gallon change in the price of petroleum products such as gasoline, all else being equal.